Though another exciting season in the English Premier League ends Sunday, various table positions – including first place – are still up for grabs. Here’s a breakdown of Sunday’s games, all kicking off at 10 a.m. EST. 1. Manchester City v. Queens Park Rangers – The most important game of the day, this match has both title and relegation implications. If Man City wins, the club clinches its first league title since 1968. If QPR wins or ties, they will avoid relegation and reap the financial benefits of remaining the in EPL for another season. If they tie, City’s fate will be in the hands of the soccer gods. Another added wrinkle is the return of Mark Hughes, Man City’s coach prior to the arrival of Roberto Mancini. Look for Man City to field an attacking lineup, foregoing two holding midfielders in search of a first-half lead. QPR will put up a good fight, but Man City should be hoisting the Champions Trophy come by noon. 2. Manchester United v. Sunderland– Trailing Man City in goal differential, the Red Devils need a Sunday collapse from City to claim a second consecutive title. Sir Alex Ferguson says this has been a down year for United, and a year without a trophy in four competitions (FA Cup, Champions League, Carling Cup) will surely be disappointing. Led by Wayne Rooney and the ageless Paul Scholes, United should easily dispose of Sunderland. The hosts feature many quality players, but United typically rises to the occasion in key matches. Expect them do so Sunday. 3. Stoke City v. Bolton Wanderers – Simply put, this is a must-win for Bolton. A win combined with a QPR loss and they remain in the EPL. A loss or tie, or a QPR win or tie (unless Bolton wins by ten goals), relegates Bolton to the Championship. Though terrible at home, Bolton has been in surprisingly good road form this season. The club will need to be in top form at Stoke City, as Britannia Stadium is a notoriously difficult place to win. However, with nothing but pride to play for, Stoke City should be beatable. Expect Owen Coyle’s side to press, score a couple first-half goals and endure a frantic ending en route to securing a victory and EPL status for next season. 4. Everton v. Newcastle United – Locked in a battle for the last two Champion’s League berths (only one if Chelsea defeats Bayern Munich on May 19th), the Magpies have surprised critics all season. With players Demba Ba, Yohan Cabaye, Hatem Ben Arfa, Tim Krul and mid-season signing Papiss Demba Cisse in the peak of their careers, Newcastle has risen to fifth in the EPL table. Not far behind, Everton, under the excellent guidance of coach David Moyes, is poised to finish in the top-half of the table again. This match has all the makings of an instant classic, as Newcastle will search for early goals in its attempt to reach Europe’s top competition. Everton, however, is famed for its late comebacks. I expect Goodison Park to be rocking when Everton is in the lead when the whistle blows after 90 minutes. 5. Tottenham Hostpur v. Fulham – Another game with Champions League implications, Tottenham versus Fulham should be a face-paced, high-scoring affair. Led by midfield maestro Luka Modric and winger Gareth Bale, Tottenham must win (assuming Arsenal wins) and hope for a Chelsea loss in the Champions League final in order to qualify for next season’s competition. However, with Fulham producing its finest season in the EPL to date, Tottenham will be pushed to the limit. Along with Arsenal’s Robin Van Persie, Fulham’s (and U.S. international player) Clint Dempsey has been the league’s best player this season and will be a lot to handle for Tottenham’s shaky back line. Expect Tottenham to disappoint its home fans and lose following a late Fulham goal. 6. West Bromwich Albion v. Arsenal – Under England’s new manager Roy Hodgson, WBA is on the verge of a top 10 finish. However, Arsenal is a superior team. With Champions League qualification motivating them, they should win going away. Van Persie is the newly crowned EPL Player of the Year and will finish his finest season as a Gunner with a brace that secures Arsenal a position in Europe’s top competition next season. 7. Chelsea v. Blackburn– With Blackburn already relegated and Chelsea likely resting its top players in anticipation of the Champions League final, expect a rather boring contest. Steve Kean’s men may try to end the season on a high note, but Chelsea’s depth and second team will overmatch the Rovers. 8. Swansea City v. Liverpool – Stressing beautiful football, Swansea City has been a revelation this season. On the backs on Scott Sinclair, Joe Allen, Gylfi Sigurdsson and Michel Vorm, Swansea City has been one of the Premier League’s most exciting teams. Liverpool, however, has had another disappointing domestic season in the league. Though it won the League Cup and finished second in the FA to Chelsea, the Reds likely will once again miss out on Europe (they currently sit in eighth place). The game itself should be a thrilling affair, as Euro 2012 hopefuls look to impress new manager Hodgson ahead of his announcement of the squad. In-form Andy Carroll should be the difference, allowing Liverpool to end the season on a high-note. 9. Norwich City v. Aston Villa – Both teams are guaranteed EPL football next season. This match pits overachieving Norwich City versus chronically underachieving Aston Villa. Expect Graham Holt to torch Aston Villa’s soft back line to end the season as EPL’s top English scorer not named Wayne Rooney, helping earn Norwich City a season-ending victory. 10. Wigan Athletic v. Wolverhampton Wanderers – The most boring, meaningless game of the day. Roberto Martinez’s Wigan beats Terry Connor’s Wolves. Every morning when I wake, there are three websites I routinely check: ESPN, CNN and the Drudge Report. Yet when I woke this past Sunday morning, my browsing session ended abruptly after coming across a disturbing headline: Fabrice Muamba, the promising young Bolton and English holding midfielder, had collapsed during his team’s FA Cup match versus Tottenham. Normally I gloss over such heartbreaking articles, spending no more than a few minutes digesting the meaning of the event. But for no particular reason, Muamba’s tragic collapse resonated with me. Maybe it is the shock of a perfectly fit 23-year-old going into cardiac arrest. Maybe it is the realization that for everyone, each breath could be your last. Or maybe it is the fact that to me, people who have overcome so many obstacles, like Muamba, deserve better. But for whatever reason, Muamba’s collapse resonated with me. Growing up in war-torn Zaire, he emigrated from his country to England in 1999. After joining Arsenal Football Club’s famed Youth Academy in 2002, he rose to the professional ranks by 2005. 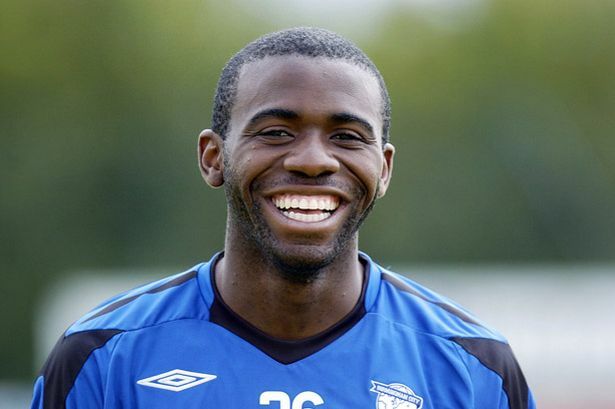 Following a successful loan spell at Birmingham City in 2006, Muamba secured a permanent deal in 2007. After Birmingham was relegated from the Premier League at the end of the 2007 season, he transferred to his current team, the Bolton Wanderers, where he has been a keg cog in the center of midfield since 2008. Combining a mix of speed and superb tackling ability, Muamba’s energetic style of play allowed him to be recognized as one of England’s top young players. To this date, he has more than 33 appearances for the England U-21 side and likely was going to take part in the upcoming 2012 Olympic Games in London. But his off-the-field successes are more important than his on-the-field accomplishments. Like many immigrants, Muamba was unable to speak English upon his arrival in East London. Yet Muamba overcame the language barrier to achieve academic excellence in his teen years. He became a father to a son three years ago, and this Valentine’s Day became engaged to the child’s mother. Muamba had his whole life ahead of him and yet, during the 41st minute of Saturday’s match, it was all almost unfairly taken away. Watching a clip of the incident on YouTube, one does not actually see Muamba fall as he went into cardiac arrest. Rather, you see the distraught faces of everyone at White Hart Lane, including his fellow players, many of whom walked off the pitch with tears in their eyes. But thankfully, due to the amazing work of the Bolton and Tottenham medical staff as well as the staff at London’s Chest Hospital, Muamba’s heart miraculously restarted. He is currently off the ventilator, breathing on his own and is beginning to speak softly and show signs of movement in his limbs. Now, I need to be frank. The goal of this article isn’t to preach to its readers that you need to drastically change your life to become a healthier person who eats right and exercises frequently. While recommended by physicians everywhere, that lifestyle is not for everyone. And as Muamba’s collapse demonstrates, even the fittest athletes are vulnerable to sudden heart attacks. Rather, my hope is that this brief attempt at telling Fabrice Muamba’s story allows you to take a moment out of your day and put your life into perspective. I know that sounds cliché, but it’s tragedies like Muamba’s that make such a statement significant. So I ask that you each ask yourself what’s important, who’s important and what you want or need to accomplish that you haven’t already. Whether it’s forgiving someone, going skydiving, or conquering D’Jais Happy Hour, do what you feel is right and don’t look back. You only get one shot in this world, and like Fabrice Muamba already has, you better make it count. And Fabrice, in the words of the late Jim Valvano, “Don’t give up, don’t ever give up.” The world, your son, and your fiancée need you. God Bless and we pray for a speedy and healthy recovery.